Four stones each from two populations of cystine calculi, one with rough external surface (cystine-R) and the other with smooth external surface (cystine-S), were studied for their crystalline structure with scanning electron microscopy and stereoscopy. 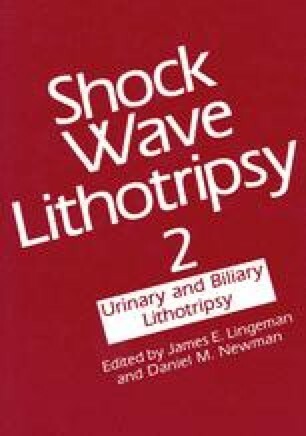 Two stones each of cystine-R and cystine-S, calcium oxalate monohydrate (COM), calcium oxalate dihydrate (COD), struvite/apatite, and brushite were fragmented with shock wave lithotripsy and the fragmentability compared. Fragments resulting from cystine-R and cystine-S shock wave lithotripsy were examined under a stereoscope to assess plane of cleavage or fracture. Results showed that cystine-R is comprised of well-formed blocks of hexagonal crystals; whereas, cystine-S has small, irregular crystals that are poorly formed and interlacing. The center of a cystine-R stone was similar to that of the periphery, but the center of a cystine-S stone was formed of blocks of hexagons similar to but smaller than the cystine-R. Fragmentation with shock wave lithotripsy revealed that cystine-S is the least fragile, COD and struvite/apatite are most fragile, and cystine-R, brushite, and COM are in the intermediate fragility range. The possibility of the patient having cystine-R calculus should be considered during therapeutic procedures.